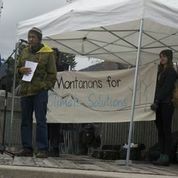 Post by Nick Engelfried: On Saturday, April 26th, hundreds of people affiliated with more than seventy organizations gathered at rallies in thirteen Montana communities to support taking immediate steps to curb climate change. From Missoula to Billings and from Lame Deer to Kalispell, ordinary Montanans came together to show our elected officials that we want solutions to climate change, and an end to dirty energy proposals like Arch Coal’s Otter Creek Mine. 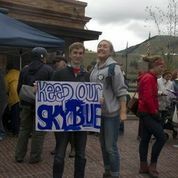 Here in Missoula, Blue Skies Campaign played a role in organizing a rally that drew more than 300 people to show support for climate action. We listened to speeches from local leaders in the fields of climate science, community health, and environmental action. After the speeches, people stayed to learn about opportunities to take action at booths and tables set up by local community organizations. It was a positive event that highlighted the degree to which people in Montana care about climate change and clean energy, and the fact that we are ready and willing to hold our elected leaders accountable. together on one day to call for climate action. A variety of local and statewide groups were involved in organizing rallies in places as diverse as the Northern Cheyenne Reservation town of Lame Deer, where many locals are fighting the expansion of coal mining on and near reservation lands; and Whitefish, where the effects of climate change on Glacier National Park and other nearby natural areas threaten the local tourism economy. In fact, if there’s one lesson from Saturday’s rallies, it’s that climate change and fossil fuel extraction impact people in every part of Montana, and communities all over the state are ready for clean energy solutions. At Blue Skies, we were proud to be participate in this multi-community day of action by being part of the Missoula event. I can only hope Saturday’s rallies will turn out to be the first of many similar collaborations between people across the state who are determined to welcome a clean energy future to Montana.